From Arse To Elbow: Who Owns What? One aspect of the Panama Papers that has received little attention so far is the impact that secrecy jurisdictions have on our understanding of the national accounts. By this I mean our "balance of payments", i.e. the flows of money between us and the rest of the world. 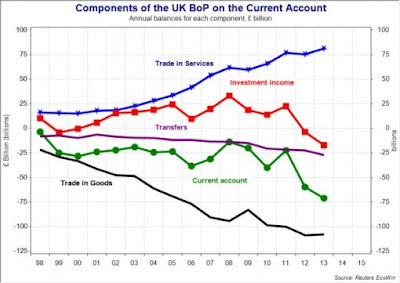 Traditionally, the focus has been on the trade balance - the money we make through exports versus the amount we spend on imports - which acts as a proxy for the health of UK Plc (a less daft metaphor than the equivalence of government spending with a household). Since the 1960s, we have been used to the tale of declining manufacturing competitiveness offset by increased "invisible earnings" on services. What has come to the fore in recent years has been the flows of investment income - i.e. earnings on foreign assets owned by UK citizens versus payments to foreigners arising from their ownership of assets in the UK (which count as liabilities in the national accounts). The ONS recently explained the worsening balance of payments in terms of these relative investment positions: "The current account of the balance of payments declined to a record deficit of 5.2% of GDP in 2015, largely as a result of a fall in earnings on UK foreign direct investment (FDI) assets abroad relative to overseas FDI assets in the UK. The exposure of the UK to changes in commodity prices – in particular the oil price – and weaker overseas earnings of some the UK’s largest multinational companies help to explain this recent fall". In other words, the global recession has reduced the returns on our investments in Australian mines and Gulf oilfields more than it has reduced returns on UK assets owned by foreigners. This has led some commentators to see the issue as cyclical, suggesting that it will right itself in time. Yet the ONS's own data (from 2012 - see fig. 4) shows that the UK has a peculiar profile, closer to the economic periphery of the EU than the core (i.e. more dependent on inward investment), which suggests there are stuctural factors in play. There are three things to note here. First, if we are dependent on high yields abroad to maintain a healthy balance of payments then we face a problem as markets like China regress to the mean in terms of growth rates. While some economists believe that Africa can provide the next spurt of global growth, there has to be a question mark over the idea that high-yield emerging markets are an established and thus reliable feature of the global economy, particularly if they are based on extractive industries and base commodities. History suggests that such markets are episodic and volatile. You'll make high returns for a while but then there will be a crash and you may have to wait years before the next high-yield cycle begins. Narrower investment yield spreads, like low interest rates and over-subscribed government bonds, may be the new normal. If we don't find new high-yield opportunities abroad, we must either reduce the amount of FDI liabilities relative to UK GDP or reduce the value of their earnings (and increase the value of our foreign earnings) by devaluing Sterling. However, while devaluation might boost exports and improve the balance of payments (though it noticeably didn't do so between 2008-13), it would certainly make UK assets cheaper for foreigners to acquire, so it could simply exacerbate matters. The issue with reducing FDI in the UK as a percentage of GDP is less about becoming unattractive to foreign investors and more about directing domestic capital to domestic opportunities - i.e. we want both types of investment to increase but for the latter to do so at a faster rate than the former. In other words, we really need Hinkley C (or an alternative investment in our energy supply) to be funded by UK citizens, whether via the market or nationalisation, rather than French and Chinese citizens. Many in France appear to share this view. Second, despite the ONS focus on commodities, it is clear that poor earnings are also a feature of other sectors geared to developed markets, such as communications, and more generally of investments in the EU. Regardless of Brexit and its impact on trade, the UK needs a European economic stimulus to revive receipts but there appears to be little likelihood of this happening in the near future. It is also worth noting that receipts and payments since the 1990s have been dominated by earnings on financial sector assets, including derivatives and foreign exchange holdings as well as bank equity. While the fallout of the 2008 crash reduced these across the board (though they're still close to half the total), the impact has been marginally greater on assets than liabilities, reflecting the relatively better performance of UK property (i.e. more foreign buyers plus more UK citizens repatriating money) and the bailout and ongoing support via QE of UK banks (i.e. another byproduct of "too big to fail"). Third, the relatively better performance of FDI in the UK is clearly not attributable to the largely foreign-owned steel industry. In fact, the difference in performance between assets and liabilities is not to be found within the manufacturing sector, except insofar as it affects multinationals who are doing better at home than abroad. According to the ONS, recent increased returns on UK liabilities reflect an uptick in foreign investment in the wholesale and retail sector since 2013 (think Amazon warehouses), which may in turn reflect foreign capital attracted to an economy that has once more relapsed to a dependence on the drug of consumer-led growth. This higher rate of investment could well ease off once other countries return to better growth, but by then there will have been a step up in earnings that won't have been offset by UK investment abroad. We'll be playing catch-up. Understanding the UK's balance of payments is difficult because it requires accurate knowledge of who owns what: whether UK assets are owned by UK citizens or foreign nationals and how much UK citizens own in other countries. The problem, which David Cameron's private affairs have shone a light on, is that beneficial ownership of assets is precisely what secrecy jurisdictions exist to obscure. This is where the metaphor of UK Plc breaks down: it's like a company publishing its annual accounts with the balance sheet left intentionally blank. It is quite possible that the web of offshore funds and trusts gives us a misleading impression of the true balance of payments. For example, a UK property that produces a rental income may be owned by a Panamanian company (so it's a liability) whose shares are owned by an offshore trust registered in the British Virgin Islands whose beneficiaries are Brits (so it's really an asset). An irony is that the free movement of capital since the 80s, which has done so much to boost the value of Sterling by using the City as a conduit for global flows, may now be contributing to the risk of a sudden devaluation through its negative impact on the balance of payments. A further irony is that offshore funds denominated in foreign currencies, or Sterling funds that hedge exchange rate movements, may be among the prime beneficiaries of a devaluation. Should a devaluation be anticipated (as happened in 1992), fear might prompt a capital flight by foreign investors in UK property. Even if the underlying conditions are favourable to holding UK assets long-term (e.g. the government's determination to constrain housing supply and minimise capital gains and inheritance tax), the short-term might suggest otherwise. The final irony is that these flighty foreigners may actually be more "us" than Russian oligarchs or Malaysian speculators.